Sayre is a man of faith, but not in the traditional religious sense. Rather, the objects of his devotion are truth, freedom, communication and organization. Sayre penned his essays at a variety of venues—a hospital, a prison, MIT, etc.—and weaves his writings around them. His philosophical musings are a pleasure to read, whether he’s visiting a school for the mentally challenged or admiring the architecture of Gloucester Cathedral. In fresh and appealing prose, he describes communication, for instance, as “our means of conveying truth and sharing beauty; it is the infrastructure of love.” Readers might naturally want to know if the author believes in God, and Sayre takes his sweet time getting there; finally, he explains his view—“I recognize that there are millions whose answer lies in their belief in a creative God. 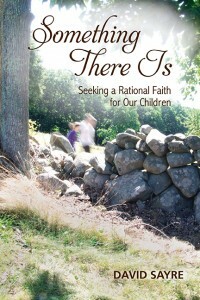 I hope they will forgive my inability to accept such a hypothesis without question”—while questioning the traditional God who “allows vast injustice to prevail.” Sayre’s deep commitment to reason appears on nearly every page; sometimes, though, it would be nice to see him lighten up more, especially in parts of the book related to family. Fortunately, Sayre’s dry wit pops up every now and again, and he admits, for example, that he got nervous auditioning for a spot in a quartet and, as he says, his self-improvement efforts at the gym leave something to be desired. He veers into his more technical language only briefly, yet overall, Sayre thinks and writes so carefully about philosophical issues that readers who don’t share his beliefs may find themselves as inspired as those who do. Thoughtful, elegantly written essays for philosophical ponderers.